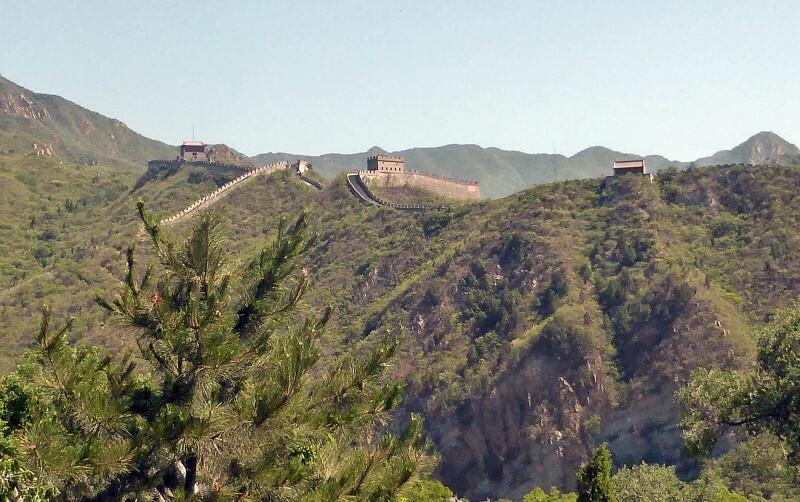 The Great Wall is often touted as being the eighth wonder of the world – but is it? 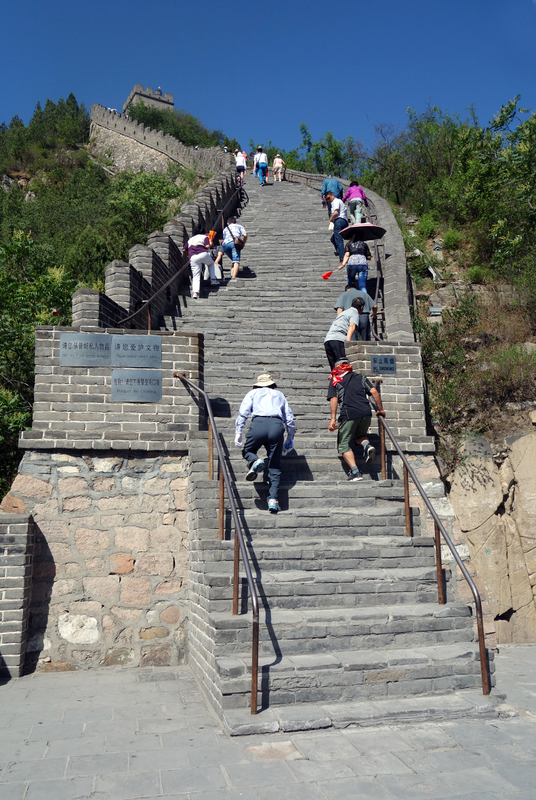 Visiting the Great Wall of China is something of a conundrum. Why was it so big, and how effective was it? We went out from Beijing to visit the Great Wall on the middle day of our visit, and we went to Badaling, which is the just about the nearest part of the great wall to Beijing, 50 miles to the north. This has been substantially re-built as a honeypot for visitors, and it is a short stretch that most people are taken to. 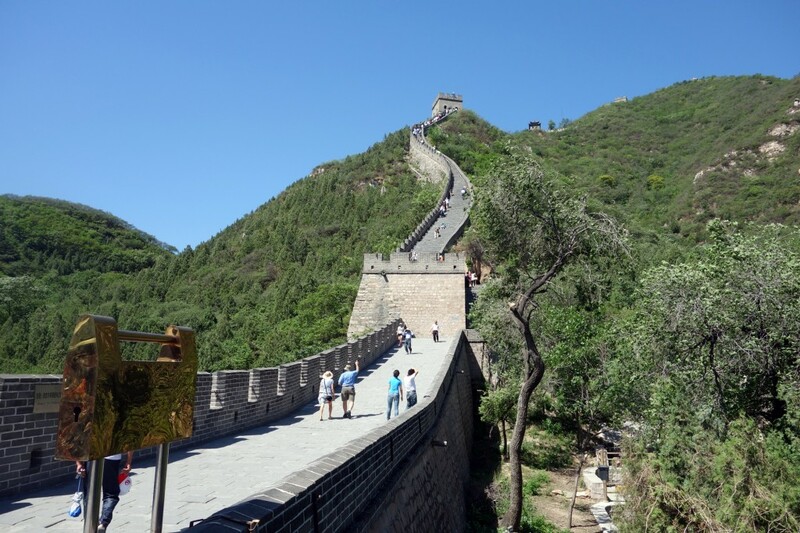 I found it interesting to compare the Great Wall with Hadrian’s Wall – which I know quite well. But what a difference there was! 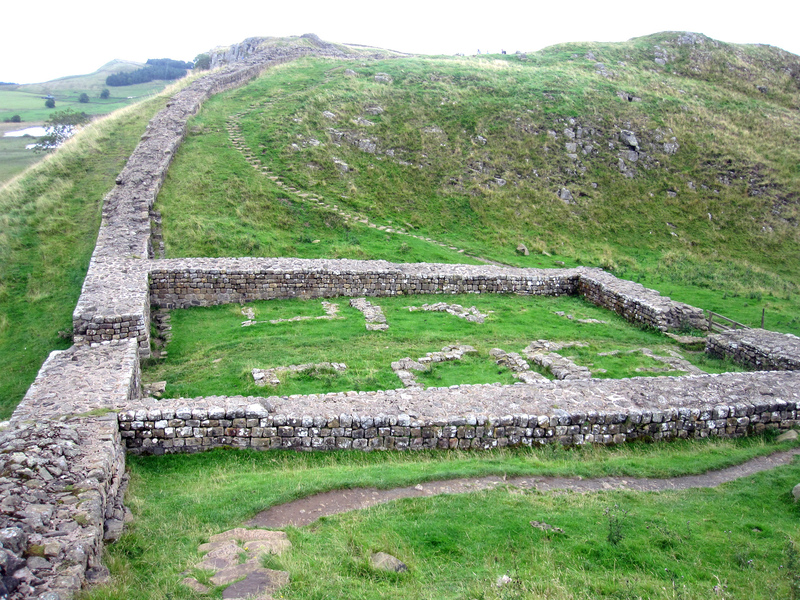 By comparison, Hadrian’s Wall is small – very small – but it was after all very successful. It worked, and worked very well and with the Antonine Wall, it kept the barbarians out for nearly 300 years. And I could not help thinking that by comparison with Hadrian’s Wall, the Great Wall was grossly over-engineered: it was built for prestige rather than for purpose . Let us look at the two more closely. The Great Wall at Badaling. Note its great width with up to a dozen people able to march abreast. 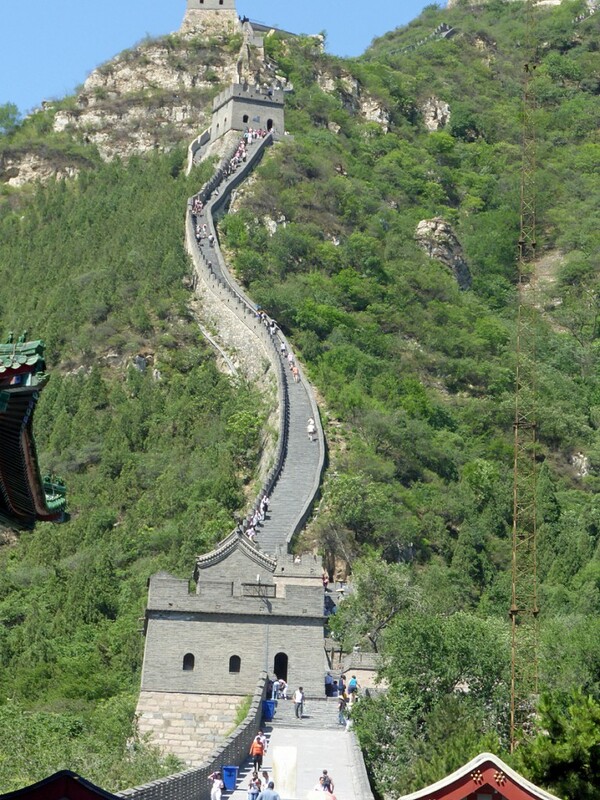 The Great Wall is extremely wide – it is 6 metres, or 20 feet wide, wide enough for 5 horses to ride abreast, or 10 men. On Hadrian’s Wall there is a great debate as to whether there was a walkway along the top at all, but on the Great Wall you could march a whole platoon abreast along the top. Like the Great Wall, Hadrian’s wall was built over hilly territory, but the Great Wall seems to have deliberately chosen very hilly ground, which would have made it rather difficult as means of communication, because it is so steep: the part we saw was so steep that it would have to be climbed by stairs. It seems almost as if it had been deliberately engineered to be as uphill and down dale as possible – which was hugely impractical from the defensive point of view. The dates are very different too. Hadrian’s Wall was built in the decade following AD 122, but most of the Great Wall that we see today was late, built towards the end of the Ming Dynasty in the 16th century, 1400 years after Hadrian’s Wall – Badaling is dated 1504. The Wall was in fact built in two main stages. The first stage was at the very beginning of the Chinese Empire, when the first emperor, Qin, who united the six warring states, sent out his main general to build a wall across the North to keep out the Barbarians. He linked up two earlier walls to form a great wall stretching some 4912 miles. China always had problems with the peoples to the north, for there is a major ecological difference. China is extremely fertile by nature and can bear a large population of farmers. In the deserts and mountains to the north it is difficult to grow crops, and it is a terrain more suited to nomadism and horse riding. The nomads became fierce warriors who were always tempted to pillage the rich lands to the south; and the settled farmers in the south wanted to keep out these uncouth barbarians. The Great Wall was one solution, but it was expensive to maintain, and for the next 1500 years, the Empire alternated between using the Wall, sometimes extending it, but at other times it was abandoned, either because the Barbarians had won and had taken control of China and formed their own Dynasty, like the Yuan dynasty; or because the Chinese decided to use diplomacy and keep the barbarians by a system of ‘tribute’. The second major building came towards the end of the Ming period in the 16th century. The Ming were an ethnic Chinese dynasty, and proud to have taken over from the Yuan dynasty who were Mongols in origin, the descendants of Genghis Khan who later pretended to be Chinese. The Ming dynasty was a reaction; they were proudly Chinese, and for the first half of the dynasty they kept the peace by pursuing a policy of diplomacy. But in the middle of the Ming Dynasty there was a disastrous battle when the Emperor was captured and carried off as a prisoner. There was an almighty panic, and dithering, but eventually it was decided to rebuild the wall virtually from scratch, and this is the wall we see today. The earlier walls had been built with earth, tamped together with wattle work. North China is covered with loess, that is wind-blown sand which it is possible to tamp together to form a very solid wall. 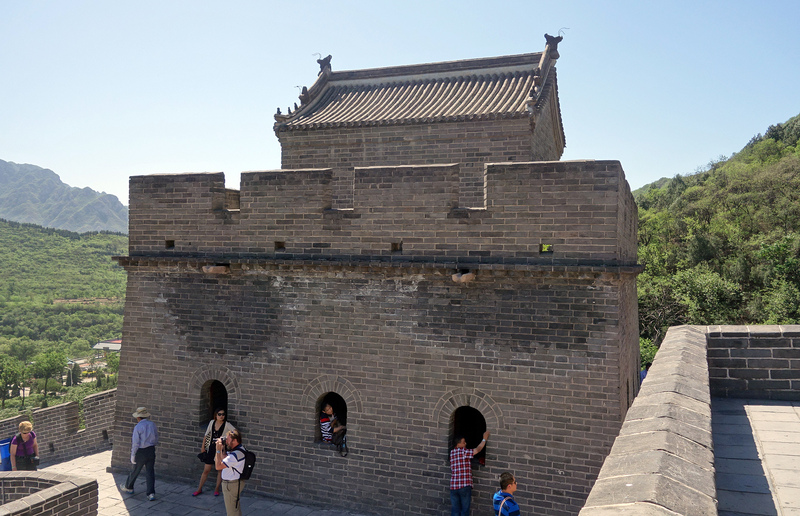 However by the time of the Ming, gunpowder was being invented and so the Ming wall was built mainly in brick and stone. The watchtowers, which in the previous system had been built every 500 yards or so and had been used for signalling, were now re-used as cannon emplacements. There was also a regular system of encampments, and many of the passes had special systems of fortification. The Ming were great wall-builders, and it is not just the Great Wall that they built, but many of the walls that surround the main administrative towns of the Empire. There were over 1000 such towns, and most of them were surrounded by a wall such as those at Xian and Pingyao. 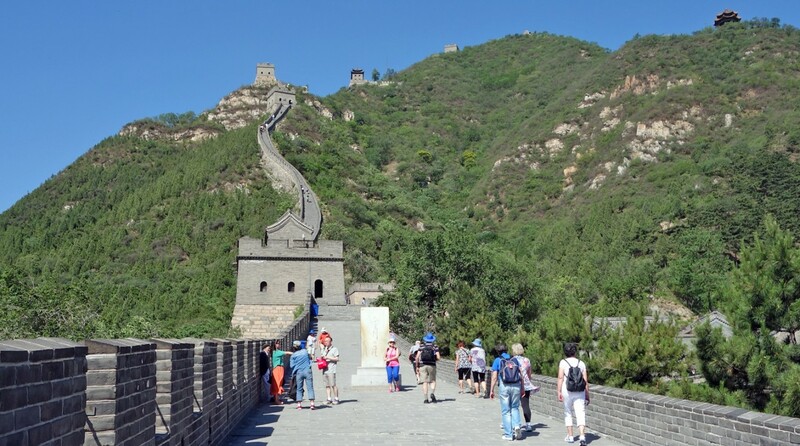 The Great Wall has not always been admired in China as much as it is today. Indeed the myth of the Great Wall was deconstructed by the American historian Arthur Waldron in his book The Great Wall of China: from History to Myth. The earlier wall was put together by the Emperor Qin using slave labour; but he also burnt books and massacred scholars, so inevitably he had a bad press from subsequent scholars, and thus the wall was seen as something to be rather ashamed of, having been built by slave labour. There is a traditional folktale of Meng Chang-Nu. It tells of a woman whose husband has been sent to the wall construction site in the far north in winter. She sets out to take him warm clothes but by the time she arrives her husband is already dead. She collapses into sobs but her grief mysteriously causes the wall to break open to reveal her husbands bones. This popular folktale appears to represent the traditional Chinese view of the Wall. It was only when the first European visitors came in the 17th and 18th century that they began to recognise the huge achievement represented by the wall. In the 20th century, the republican Sun Yatsen, having deposed the emperor, realised that an alternative symbol of China’s greatness was needed, and began to see the Wall as an emblem of China’s greatness. Chairman Mao was ambiguous, but in the Cultural Revolution, hundreds of kilometres of the wall were destroyed, sometimes by gunpowder, and it was only with the advent of Deng Xiaoping that the Great Wall was once again taken as an emblem of China’s greatness. 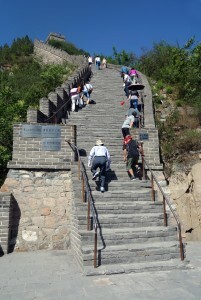 The Chinese are encouraged to visit the Great Wall at least once in their lifetime. 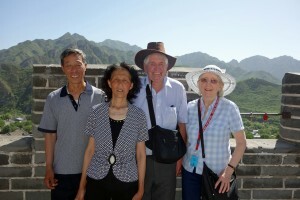 This Chinese couple wanted to be photographed alongside the strange foreign visitors! Today, with so many symbols of China’s greatness and identity being in doubt, the Great Wall has become one of the safest symbols of China’s achievements. 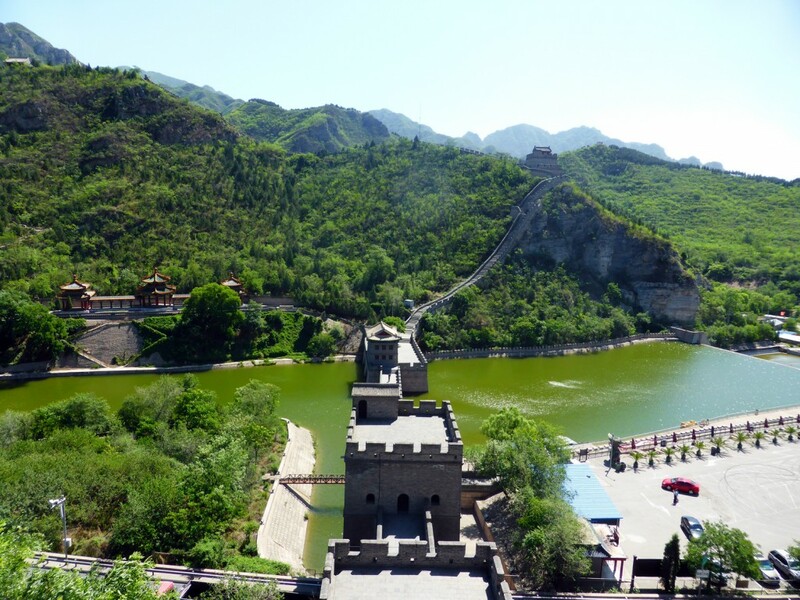 It is at last being intensively studied and taken as one of the prime sites to visit in China, not only for foreign tourists but even more for the Chinese people themselves. But how does the Great Wall compare with Hadrian’s Wall? Clearly the Great Wall represents a hugely impressive ability to manipulate vast numbers of people over a vast area. The achievement is all the more impressive when one realises that at the same time hundreds of towns around China were also being walled with walls of similar size. But from the engineering point of view, Hadrian’s Wall is far superior. It was fit for purpose, big enough, but no bigger than was needed to perform its function, and for over 200 years it worked extremely well in keeping the barbarians out. The Great Wall by contrast was hopelessly over-engineered: it was built for prestige rather than for purpose, and it eventually failed, for when the Ming Dynasty faltered, it was the Manchurian tribes from the north who walked in and formed the Qing dynasty. Thereafter the wall was neglected because it had no purpose: the Barbarians from the North had won.